So I’m a wee bit late to the post-International Studies Association Annual Conference blogging ritual, but better than never right? You read four papers by emerging scholars, but instead of a regular panel format the papers are discussed in combined poster/workshop format at one of several round-tables in a big ballroom. Authors bring poster versions of their papers, and everyone reads in advance. Authors briefly introduce themselves and their papers (3 minutes or so) and the papers are then discussed collaboratively one by one for 20 minutes or so. Audience members who show up participate freely in the dialogue. Everyone is invested in the process. More importantly, I’ll actually remember each of these scholars – Elvira Rosert, Smruthi Rammohan, Gregor Hofmann, and Ross Moret – and their projects, so it’s a great networking opportunity for me and for them. So my first point is, if you’re a junior scholar applying to ISA next year I’d definitely recommend this program; if you’re a senior scholar and you’re asked to participate, you should definitely say yes – or better yet volunteer. I will certainly do it again. Second: some thoughts on the state of theory about norms in ir/IR, and what the study of pop culture can tell us about it. You see, my JSS panel focused on norms in IR, as did another panel for which I served as a discussant. One of my takeaways from ISA this year is how much scholars are struggling to study norms independent of their effects on behavior. In short, evidence that some states violate or openly try to reinterpret international norms is often taken as evidence of a regression in the norm itself. We used to hear, for example, that the humane treatment of prisoners of war norm was being “undermined” by Bush Administration detainee policy, where in fact this was at best a case of a norm being violated. We often hear the same about the Obama administration’s use of drones in violation of war law; or Putin’s violations of the territorial integrity norm and radical reinterpretations of the Responsibility to Protect doctrine. I see this problem in papers I review as well: we are often tempted to argue that compliance with norms is the best indicator of whether or not those norms exist. Scholars seem to be creating research designs that incorporate this assumption. But Fredrich Kratochwil and John Ruggie long ago pointed out that norms are counter-factually valid. They don’t cease to exist when they’re violated. The fact that we all know someone who has gotten behind the wheel after a few too many drinks at Mardi Gras doesn’t mean there isn’t a norm against driving drunk. The fact that countries continue to torture their dissidents does not mean there is not an international norm against torture. Even efforts to retool or undo international norms – the subject of another fascinating ISA panel this year on “norm anti-preneurship” – can’t be assumed a priori to represent or cause a regression in those norms. For all we know, they may strengthen the norms by causing norm-proponents to defend them. We need research designs that allow us to hold these variables apart and answer these questions more intelligently. And scholars need data that would enable them to study the effects of norms on norm-compliant behavior in a way that distinguishes indicators of the two. 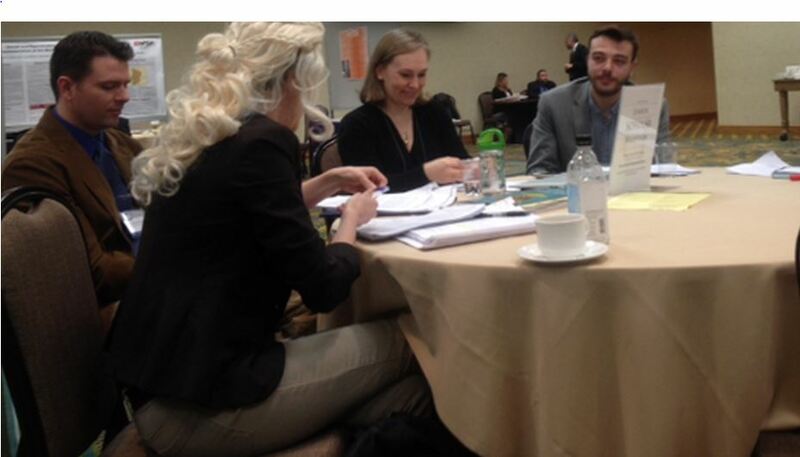 My effort to illustrate this pedagogically on the Junior Scholar panel was to begin changing into Khaleesi garb during the last 10 minutes. (Admittedly, this was also necessitated by the JSS panel running back to back with Game of Thrones: Empirical Investigations). But it served the point: norms exist despite occasional violations of them – it is the way we and third parties react when they are violated that tells us something about norms strength. It is precisely because it’s awkward to be in cosplay at ISA anywhere but at a pop culture panel that we know that this type of dress at a serious conference raises eyebrows. I know it, which is why I’d have preferred to be in a nearby bathroom stall rather than a panel on the other side of the conference center just prior to the Game of Thrones panel. And my junior scholars know it, which is why they burst into uncomfortable laughter as I donned my Khaleesi wig. The point, I told them, is that you can’t infer just because I’m wearing the wig why I’m wearing it, much less whether I’m doing it as part of an intentional campaign to undermine ISA dress codes. Perhaps I’m doing it because a counter-vailing norm compels me to. Perhaps I’m doing it to make a point. Perhaps I’m doing it because I can – because I’m less vulnerable to social sanction now that I’m tenured. Much less can you infer that there is any impact whatsoever on the standard norm of professional dress at ISA, just because a few scholars dress up as fictional characters here and there at a given conference. What matters most then for constructivist analyses of the health of norms is accounts: how actors deny, apologize for, excuse and/or justify their breaking and bending of norms in different contexts and – crucially – whether those accounts are accepted by third parties invested in the norm. In my case, at the JSS panel, I used an account that Vaughn Shannon would classify as a cross between a “justification” (an argument that the behavior in question falls outside the conditions under which the norm is expected to apply) and an “excuse” (an argument as to why extenuating circumstances prevented my compliance). Actually, this begs all kinds of questions about norms, disciplinary and international. At the Game of Thrones panel, freshly attuned to thinking about norms and social order, I found myself thinking about the various ways that pop culture artifacts were interacting with social science knowledge production on the panel itself, and how this dynamic interacted with conventional conference norms. Now this was a very interesting social context because Dan Drezner and I had specifically invited participants to cosplay – that is, to break ISA dress norms – thereby establishing a potentially safe space to do so but also creating an intra-panel normative expectation of costumry, in tension with the wider expectation about professional dress at the conference. How did all this play out? 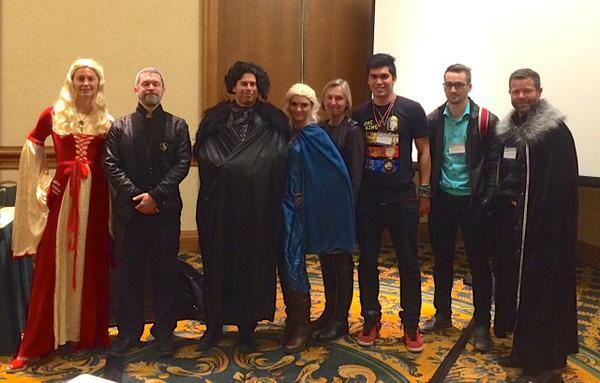 All the senior scholars showed up in Westerosi garb. Both of the two graduate students dressed down instead of up – neither came in costume nor in professional dress. The post-doc went all the way, not only coming in the most extravagant of costumes but also doing her presentation in character. Those who chose not to wear costumes seemed less worried about socio-normative costs (though admittedly going against the grain is gutsier for early career scholars than for full professors) but rather about brute financial concerns: costumes are expensive. The point of all this? As scholars of norms, we must be careful what to infer about the norm-compliant and norm-non-compliant behavior – we need to consider nested norms, and we need to consider alternate explanations. After the conference, an Australian journalist writing on Game of Thrones and politics reached out to Dan and I for sound-bytes about research on pop culture’s impact on the real world. I was asked whether, as panel organizers, we “encountered any resistance to holding a panel at a ‘serious’ conference on a popular culture topic like this?” Here is another terrific question about norms: what constitutes “serious” scholarship? and how much “fun” is permitted in a “serious” scholarly context? Dan’s and my goal was to promote solid, rigorous, empirical examinations of the way in which pop culture artifacts circulate in / impact on first-order international politics. We got our wish: Manjana Milkoreit presented a fascinating investigation of the climate change blogosphere, Miles Evers analyzed media framing of the Ukraine crisis, and Scott Watson produced a brilliant qualitative comparative analysis of fan / elite / scholarly interpretations of the show around political themes. In that sense, what we tried and I think succeeded at is showing that the study of popular culture in global politics IS serious: because it is an important way that ideas about political behavior circulate among the actors that then “do” the work of “real” politics. But that doesn’t mean that the discipline necessarily thinks of it that way. All that said (and to circle back to mentoring junior scholars at ISA) it is true that there is still a bit of a sense in our profession that studying pop culture is something you do on the side, that you don’t want to do it too early in your career. (As Alex Montgomery stated in the opening to his discussant remarks at the panel, “I want to thank all the junior scholars who risked their careers to write papers for this panel.”)** In line with my earlier point on norm change, and in line with my orientation to the empirical study of pop culture’s effects on real-world institutions, I think we could stand to conduct some empirical analysis about the question within the discipline itself. To what extent is the discipline of IR becoming more receptive to cultural questions, and what would be the indicators that our norms about ‘acceptable scholarship’ are shifting? I need more data, but the anecdotal impression is that things are opening up, and will continue to do so the more we see rigorous social science papers around these sorts of questions. In my view, the number of graduate students and early-career scholars on this panel, and the number of senior scholars who showed up in the audience to ask serious, non-frivolous questions about the relationship between culture and socio-political ‘reality’ is a testament to all that. *Note to future pop-culture panelists and to self: although my “accounts” were accepted by both sets of panel participants, they were repudiated in no uncertain terms by the gate guard outside the exhibition halls, who denied me passage to the Game of Thrones panel because I was not wearing my name tag. Now, while you may think he was enforcing the name tag rule I am certain he was in fact enforcing the professional dress rule, since never at an ISA has my freedom of movement been impeded simply for want of a name-tag, when I have been wearing a suit and blending in. Empirical evidence that norms of professional dress at ISA are alive and well, despite my and others’ flouting them. Yes. And I daresay this proves that the UN Charter is also alive and well, despite Tywin Lannister’s Putin’s shenanigans. **Alex also offered an “account” of his violation of our “5-minute time limit for discussants” which he “justified” by stating: “I don’t take orders from bastards or children.” This is no way altered the counter-factual validity of our “panel norm” but it did draw some laughs. Based on the interest generated by the Game of Thrones panel, some of us in the Intell Section are exploring putting together a panel about The Americans for next year’s ISA. I think The Americans is an interesting vehicle for exploring how we think about the Cold War in retrospect (and how we can explain it from a constructivist rather than a realist perspective) and there’s also some kind of neat ideas about gender and intelligence which are being presented. Let me know if you’d like to participate. Surely *some* norms will cease to exist if they are violated frequently enough over a long enough time period, or if they do continue to ‘exist’ in some sense, it will not be v. meaningful. Other norms persist despite periodic or even frequent violations. Krasner argued in Sovereignty: Organized Hypocrisy (esp ch.2) that sovereignty norms are in the latter category, “durable” (at least in terms of verbal allegiance and endorsement) but often violated in practice.